If you are a citizen of the northern hemisphere, when you think of conifers you likely picture the pines, firs, spruce and junipers. And likely you also tend to associate the tropics with broadleaved hardwoods and tropical islands with palms and flowering shrubs. Nevertheless, conifers are found in the tropics of the southern hemisphere, especially trees from the Araucariaceae family. These are the descendants of a quite ancient lineage of conifers that once had nearly worldwide distribution. Conifers are cone-bearing, woody seed plants of the Pinophyta family. They belong to an ancient group called gymnosperms, which appeared roughly 360 million years ago – well before flowering plants (angiosperms). The earliest known conifers date from the late Carboniferous period, around 300 million years ago, the time of the great coal age swamp forests. 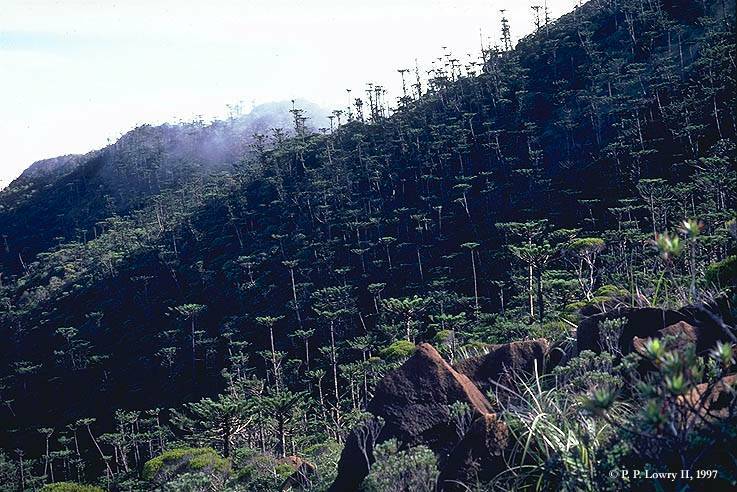 The fossil record indicates that these early conifers grew in the uplands surrounding the swamps and their foliage is reminiscent of some of today’s araucarians, like that of the Norfolk Island pine (Araucaria heterophylla). During the Permian period, as the conditions become drier, the tree-sized horsetails and club mosses give way to dry-ground forests dominated, in part, by conifers. After the catastrophic Permian extinctions, through the Mesozoic age of the reptiles and into the Triassic period, conifers continue to diversify. 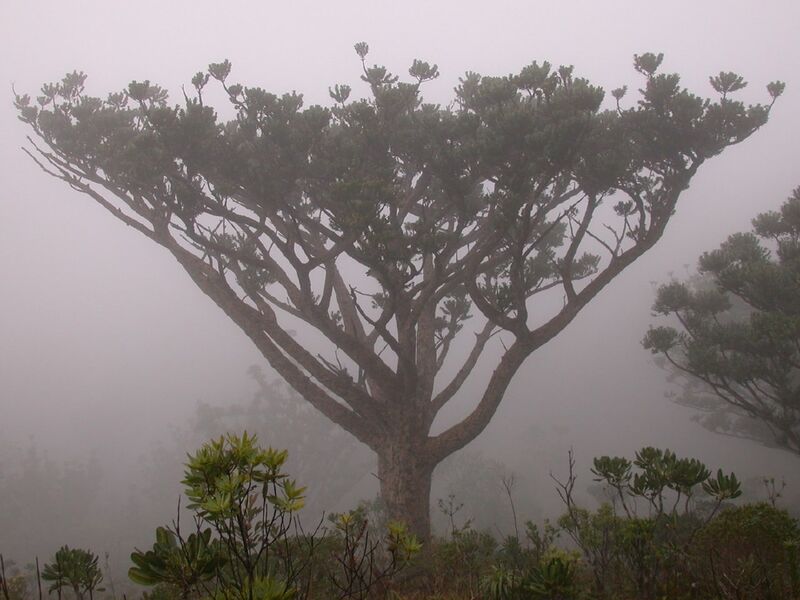 By the late Triassic, (roughly 225 million years ago) trees grew that some believe belong to conifer families extant today: Araucariaceae, Cupressaceae, and Podocarpaceae, as well as a precursors to Pinaceae (group that includes pines). However, fossil evidence from the following period is more conclusive, and these families can be said to have been part of the Jurassic flora. 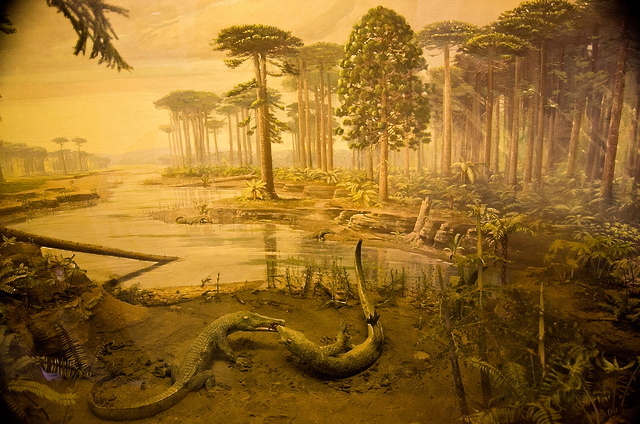 When artists depict dinosaurs or creatures of the reptile age–in paintings, dioramas and film–they often place them among trees with distinctly araucarian features. This is because of the araucarian-like fossils that date from the Mesozoic and also because the heyday of the dinosaurs coincides with the araucarians: Araucariaceae achieved its maximum diversity in the Jurassic and early Cretaceous periods, when it was distributed almost worldwide. When, at the end of the Cretaceous, dinosaurs became extinct, so did Araucariaceae in the northern hemisphere. Today, araucaria forests are limited to the Southern Hemisphere and are considered a counterpart to the pine and spruce forests of the North. Cook pines (sold as Norfolk Island pines) are popular as an “eco-friendly” Christmas tree. You may not realize it, but there ia a good chance that you have encountered an Araucarian, even if you do not live in a place where they grow naturally. You may have met one in the guise of a houseplant that originally hails from New Caledonia. 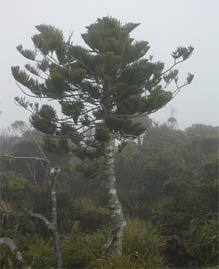 However, thanks to a mix-up in seed source long ago, you will know this plant as the Norfolk Island pine (Araucaria heterophylla) rather than the Cook pine (Araucaria columnaris). 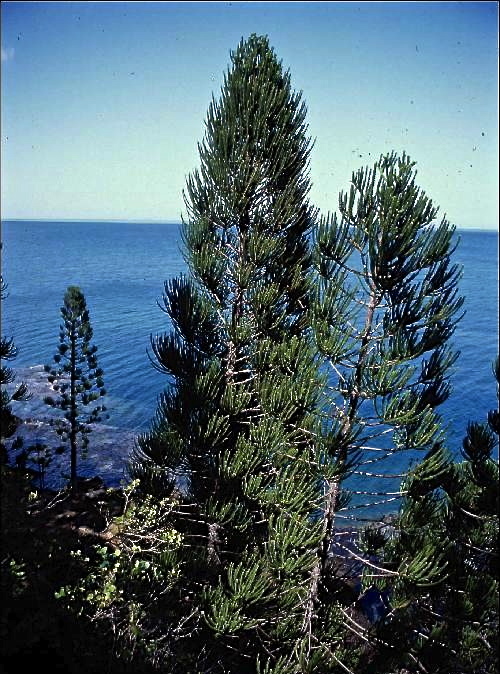 Cook pines were brought to Hawaii, probably in the nineteenth century, where they have done very well for themselves by naturalizing to their new habitat. 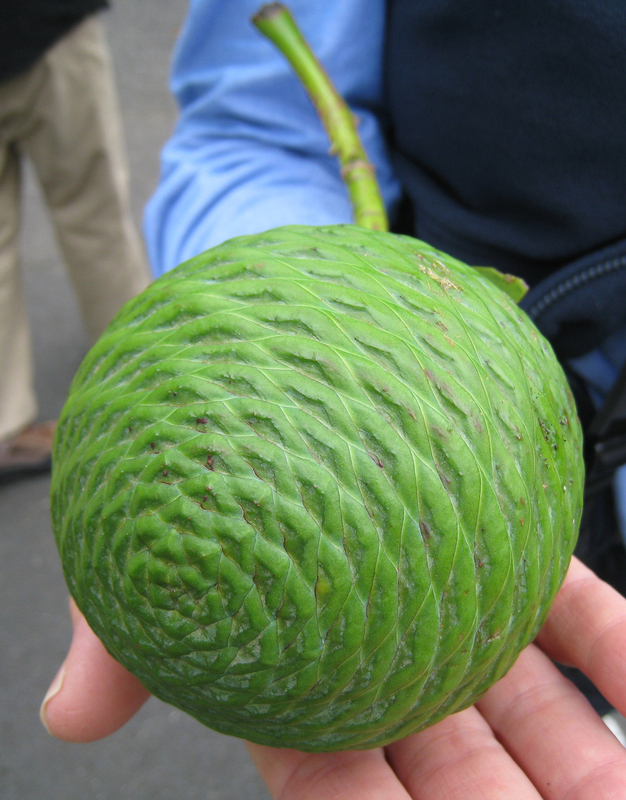 They are a common sight in Hawaii, which is the top supplier of Cook pine, rather than New Caledonia. 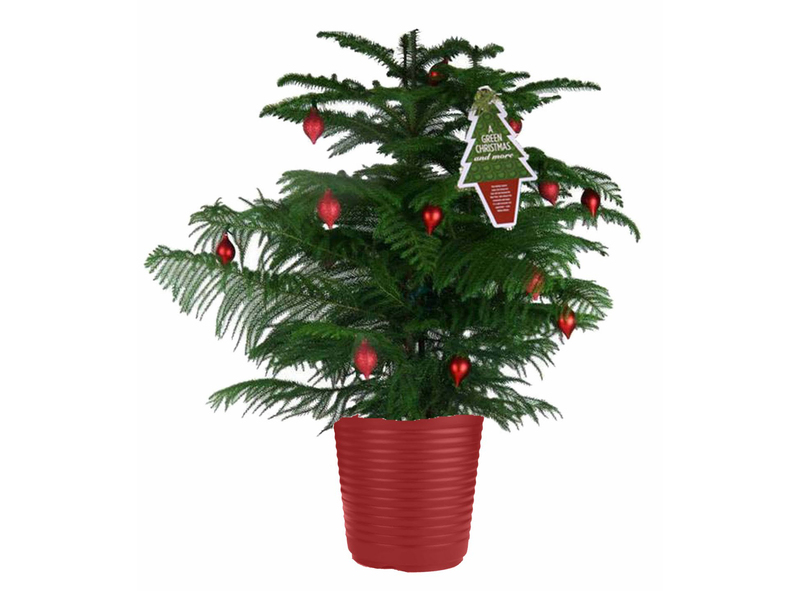 When you go to your local nursery or home improvement store and see a potted Norfolk Island pine, be assured that it is a Cook pine. 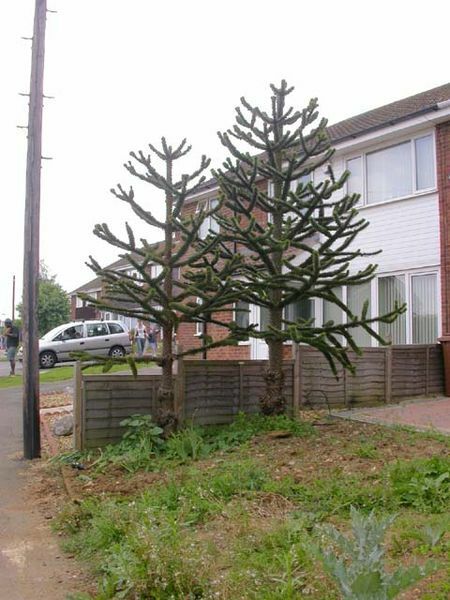 In the United States, in Northern California, Oregon, Washington and into British Columbia, the monkey puzzle tree can be seen growing in yards as a landscape plant. The monkey puzzle (Araucaria araucana) is actually a native of Chile and Argentina’s Andean slopes. 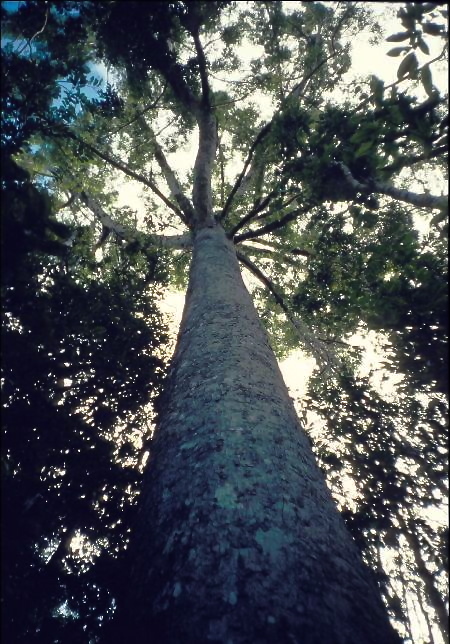 This species demonstrates a number of features that are common to Araucarians: it grows very tall (up to 100 ft) and looks quite different in its youth than at full maturity. 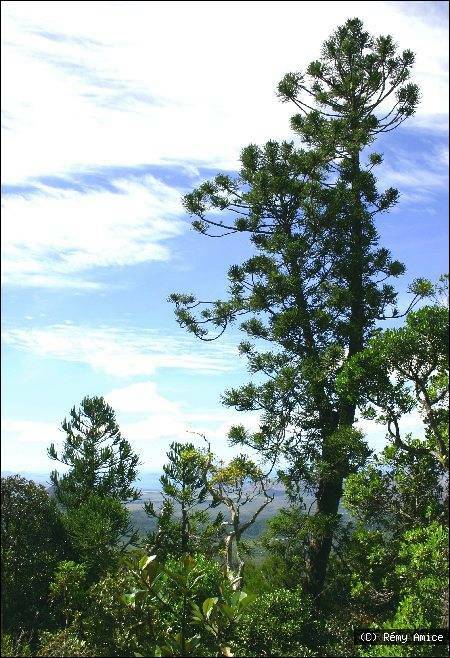 Below: On the left is a yard in the United Kingdom with two young monkey puzzle trees; on the right are fully mature trees in Chile’s Conguillío National Park. 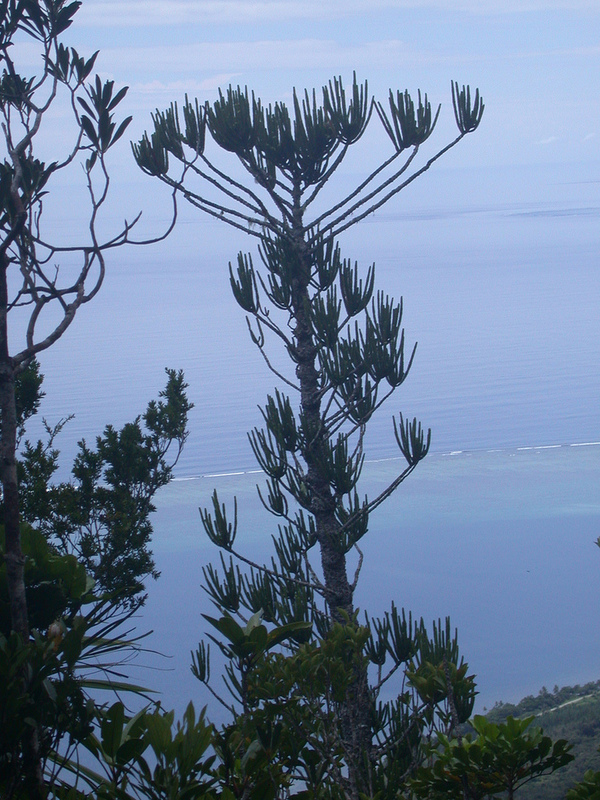 The abundance of conifers belonging to the ancient plant family Araucariaceae is perhaps New Caledonia’s most striking floristic feature. 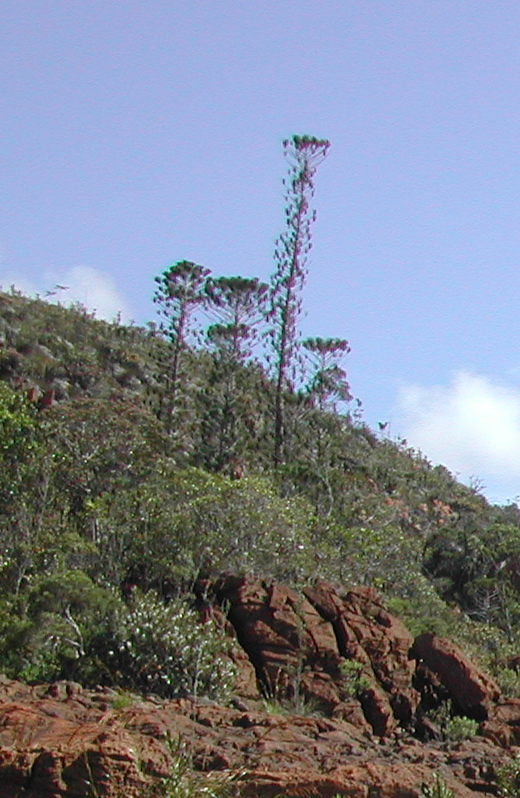 Out of 41 species in the family Araucariaceae, eighteen are endemic to New Caledonia. 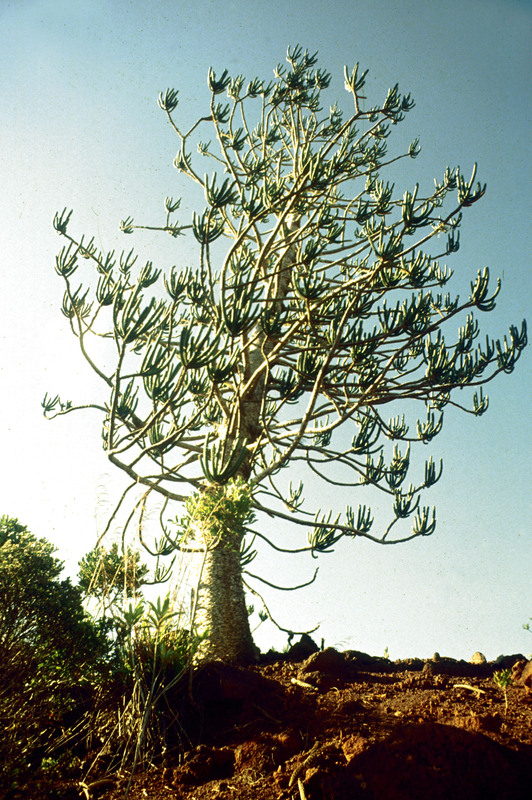 In the genus Araucaria alone, thirteen of the nineteen known species are endemic to New Caledonian, where they occur from sea level to 3,000 feet elevation. The collection at the Atlanta Botanical Garden is especially rich in tropical conifers and includes all but two species of New Caledonia’s Araucaria. These trees are in many cases imperiled, so their IUCN ( International Union for Conservation of Nature and Natural Resources) conservation status is listed with each entry. COOK PINE, COLUMNAR PINE (Araucaria columnaris) If you guessed that “Cook” refers to explorer Captain James Cook, you are correct. 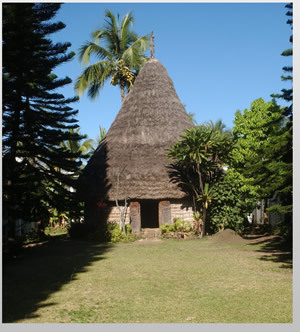 On September 4, 1774 Captain Cook and the crew of the HMS Resolution became the first Europeans to visit New Caledonia. Approaching the main island, they saw “a vast cluster of … elevated objects.” The men placed bets as to whether they were trees or large stone pillars. Once ashore, they found trees that resembled pines. 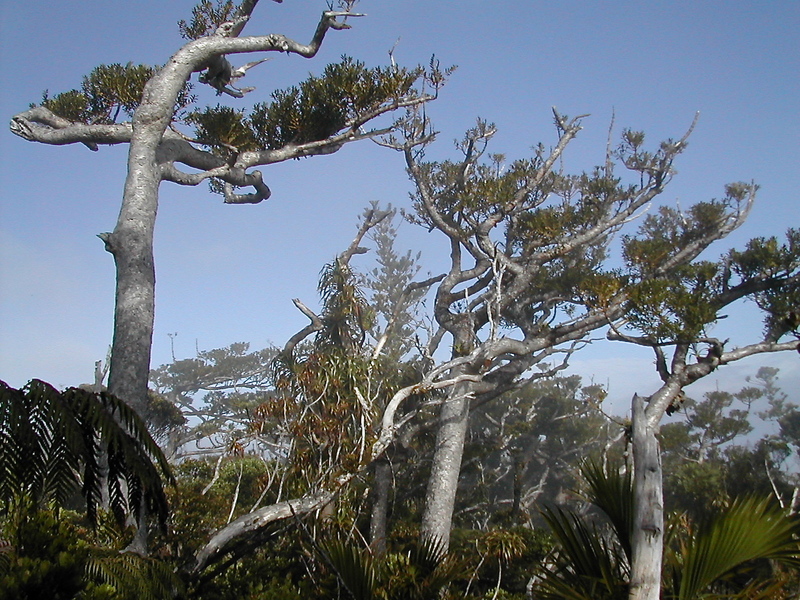 Cook regarded such tall, strait trees as a boon to sailors: “Excepting New Zealand, there was not an island known in the South Pacific Ocean, where a ship could supply herself with a mast or yard.” The tree seems to achieve its columnar shape only where it grows in its native habitat, on the coastlines of Southern Grande Terre, the Isle of Pines and Loyalty Islands. There they are battered by winds and tropical storms that knock out some of their limbs. A. Humboldtensis growing on the southern slopes of Mount Humboldt. Photo P. Lowry. 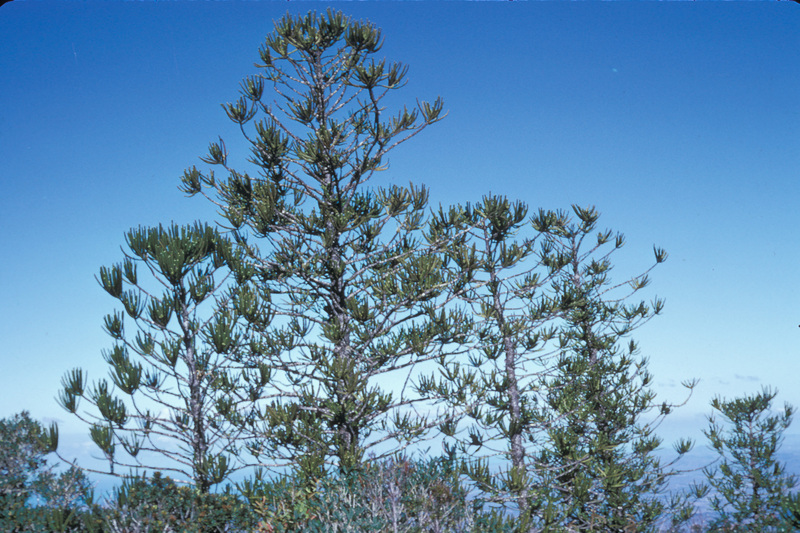 The lush araucaria is found in coastal serpentine soils, often upland from Cook pines. Photo Bernard Surpin. LUSH ARAUCARIA, COAST ARAUCARIA, SAPIN DE NOËL ARAUCARIA (Araucaria luxurians) Growing on the serpentine cliffs on the southern coast of New Caledonia, the lush araucaria bears some similarity to the Cook pine. As both its common and scientific names suggest, the lush araucaria’s foliage is more luxuriant than the Cook pine. 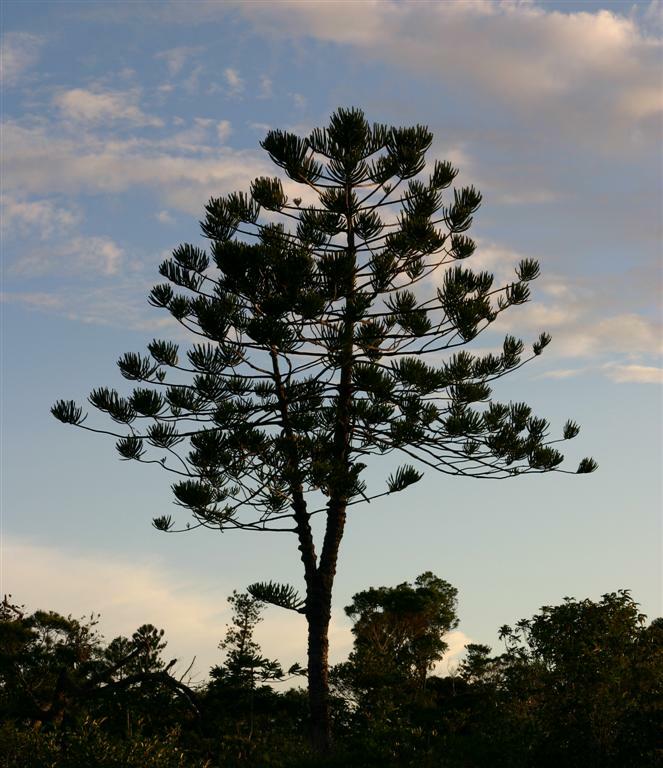 The lush araucaria grows in more of a conical shape, making it the Christmas tree of choice on the islands. Unfortunately, due to its small distribution and small populations, the lush araucaria is particularly vulnerable to the mining activities in its habitat and its numbers have been on the decline. 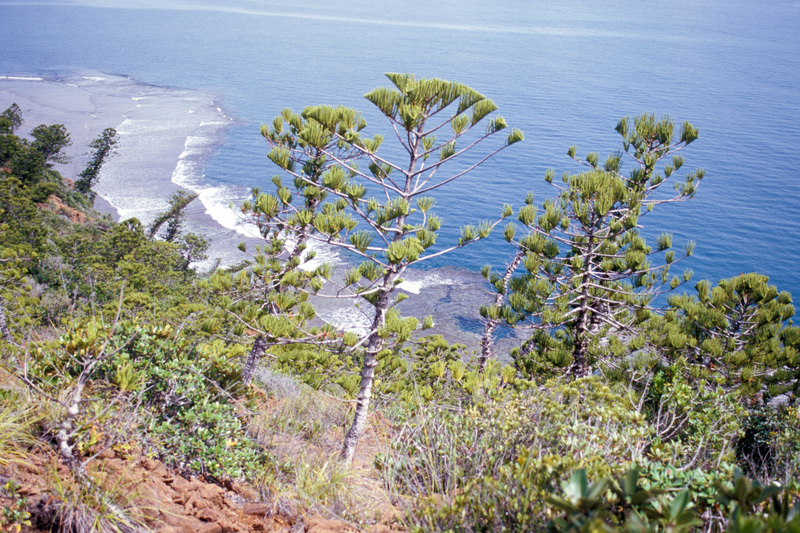 Araucaria montana and the barrier reef beyond, Mont Panié. Photo Tim Waters. 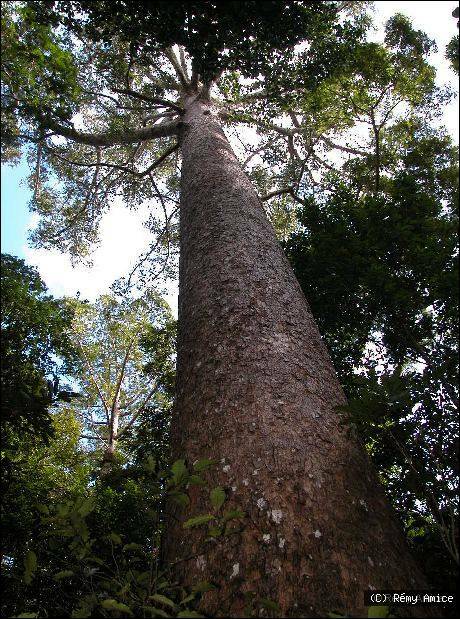 The forest giants of New Caledonia belong to the genus Agathis, also called kauri trees. Kauri is a Maori word that originally referred to New Zealand’s Agathis australis but now is commonly applied to all species of Agathis. With long, thick trunks, kauri trees are prized for their timber and consequently have been heavily logged. 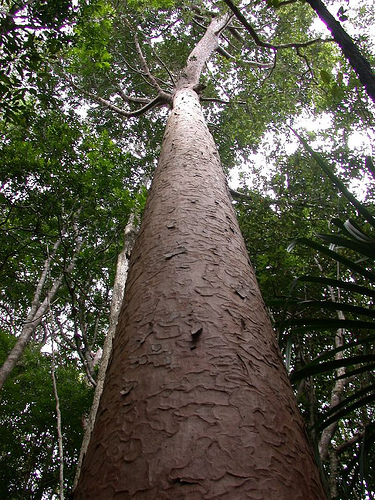 They are also highly resinous, and large deposits of kauri gum form where their branches fork. This gum, which helps the trees heal from injury, was harvested for use in the varnish industry. Giant Agathis lanceolata (Araucariaceae) tree in the Vallée des Kaoris, Monts Koghi, southern New Caledonia. Photo Tim Waters. 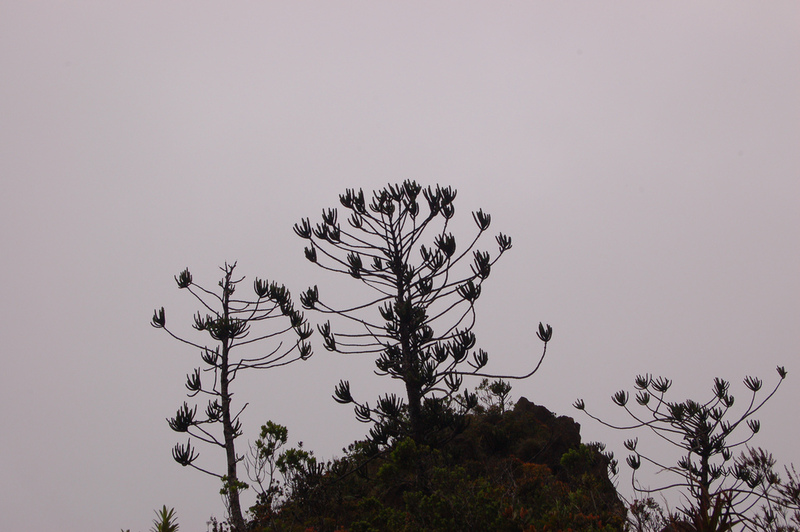 Agathis ovata (Araucariaceae) in the mists of Mount Dzumac. Photo Tim Waters. Little, Elbert L. Jr., Roger G. Skolmen. Agricultural Handbook no. 679. U.S. Dept. of Agriculture, 1989.